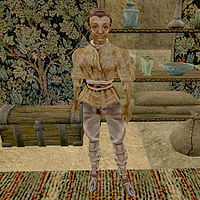 Jeanne is a Redguard trader who has a shop in the western canalworks of Vivec's Foreign Quarter, where she buys and sells all manner of goods. A rival merchant, Balen Andrano, would like to cause trouble for the competition, and has devised a rather unique method of doing so. Play them against each other, and you can earn some useful rewards. This page was last modified on 25 December 2013, at 18:41.